← Shakespeare’s Poetics (263pp) Cambridge University Press, Paperback Re-Issue 2010 of the 1986 hardcover. 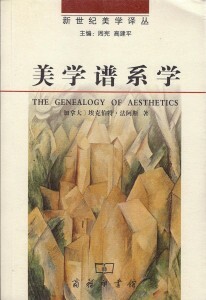 A Chinese translation (Simplified Chinese) of The Genealogy of Aesthetics has been produced by The Commercial Press (Beijing), 2011, translated by Jia Yan. Shakespeare’s Poetics (263pp) Cambridge University Press, Paperback Re-Issue 2010 of the 1986 hardcover. The Genealogy of Aesthetics (450 pp) Cambridge University Press, 2002.